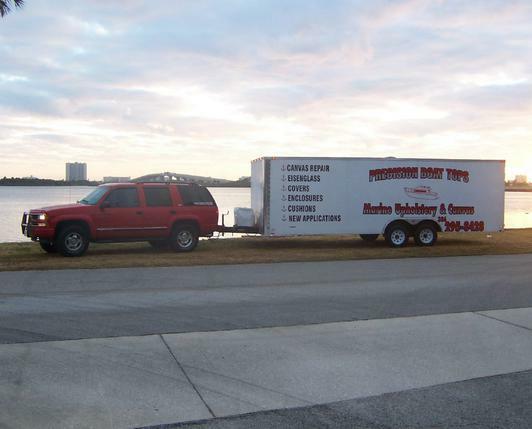 Precision Boat Tops and MarineUpholstery is the only full service, completely mobile & Store front upholstery shop located at 412 Grant St Port Orange, FL 32127. We offer a variety of restoration/repair services on any class of marine recreation equipment, RV's, and home or office. We repair any of these products to OEM standards or design custom interior packages using trend setting fabrics, canvas, vinyl or leather. We specialize in custom interior packages at affordable and very competitive pricing. Our family has provided boat, auto and furniture upholstery and restoration services since 1976. We are committed to producing the highest quality upholstery product possible and pride ourselves in customer satisfaction. Find out about our reputation first hand, just walk the docks! We welcome the opportunity to do business with you.